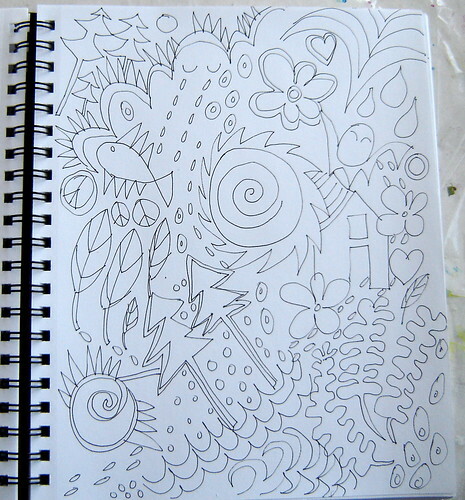 The process of learning to make art is like that of learning to speak. You learn the language, the grammar, the idioms. But what you say with it is totally up to you. – Jane Davies in Abstract Painting: the elements of visual language. You know how it is. Sometimes you plan one thing and it leads to another which leads to still another. Finally, even though people have seen my work at various venues including in our studio, it didn’t prepare them for seeing a collection of 30 paintings in one place. That was a real eye-opener for me about the importance of viewers being able to see a lot of your work at one time to get a true sense of the type of painting you do. For these reasons alone, the art show would have been a great success for me. But that’s not all. I had the chance to talk to people about what I do and why I do it. Most artists work in solitude and in spite of posting images via the internet, there is nothing like seeing the work live and having a real conversation with viewers and collectors for an exchange of ideas and reaction to take place. 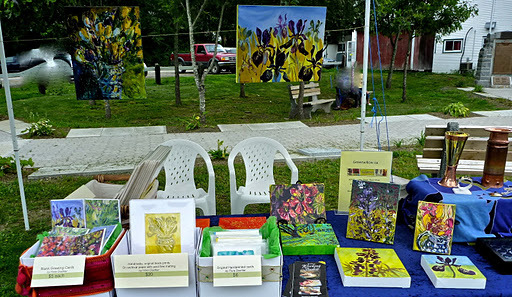 I also sold paintings which was a wonderful affirmation and motivation to continue. If you are sitting on a collection of your work, whatever it may be, I suggest you take the step of arranging your own pop-up show because it will lead to new opportunities for your growth as a person and as an artist. Snow has been falling all Coinstar online day and all night. 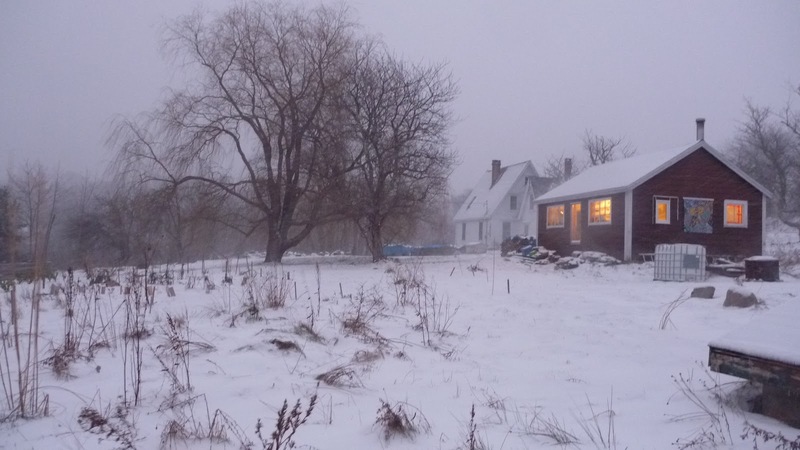 Fortunately, our commute to the studio is a shortcut through the barn and down a snowy path. Creativity calls! Our Green Willow tree, Cordelia, has finally dropped her leaves. A Cherry tree stands to the right and produces tasty cherries that drip down your chin in the summertime. Mostly the birds get the bounty as the limbs are too high for us to reach. Our studio is the red building. The other two ‘public sides’ are painted periwinkle blue. 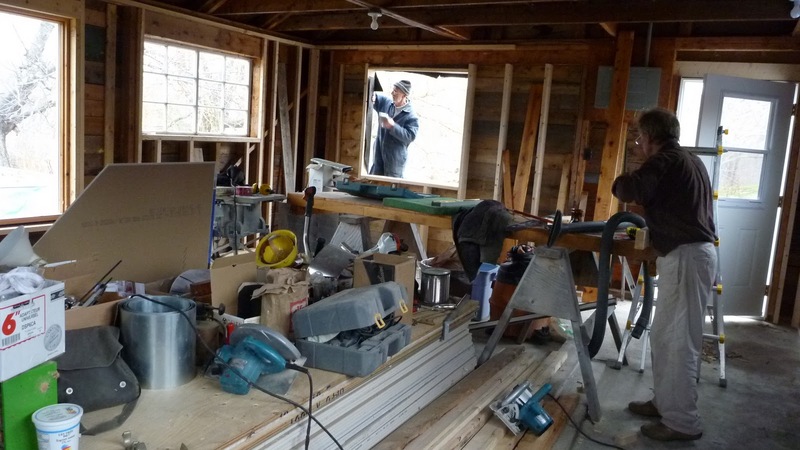 We heat it with a wood stove and a small space heater. 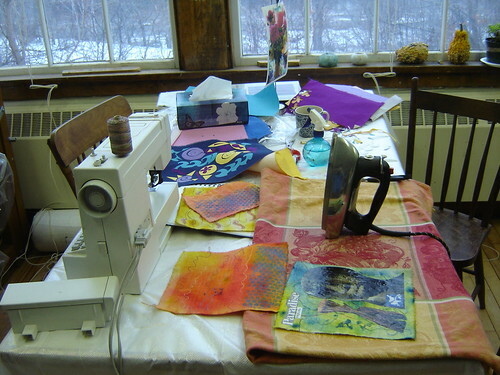 2010 was the ‘birthing’ year for our Green Willow Studio. 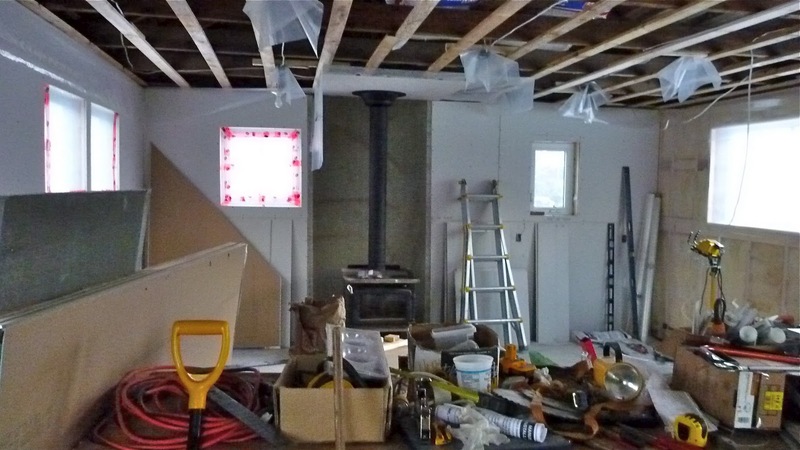 We started with an uninsulated garage and transformed it into a warm, walled and electrified studio! 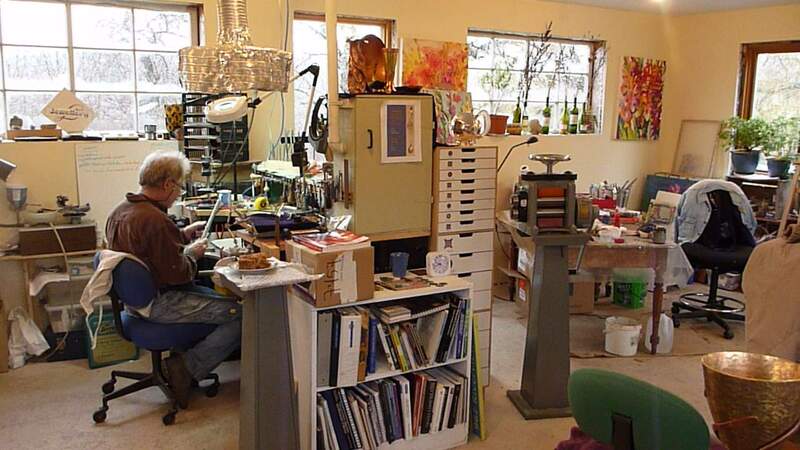 It took us some time to get everything arranged so that a silversmith and a painter could work in the same space. Together, yet apart. Most of the time it works. We listen to music or to podcasts. We break for tea or coffee and either talk about our work or we go for a walk around the garden to get a different perspective. It is a thrill for us both to have the luxury of such a well lit room (there are windows on all four walls!) and to be surrounded by garden and a wild field where pheasants live. 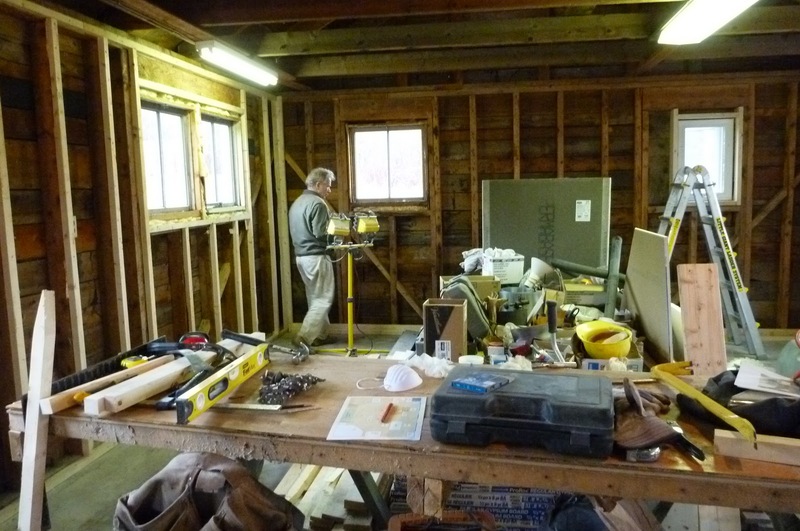 As part of the Bear River working artists studio tour it was essential for us to have our studio ready for the beginning of the tourist season in May. We set up a display area in the studio where people can buy our work. We have met some wonderful people that way and have sold some pieces. My painting sales this year at the Flight of Fancy, at Paint the Town and in the studio were motivating and rewarding. A series of one-on-one art coaching and tutoring in painting has helped me to share my painting techniques and to practice teaching. Attending the Bear River Artists and Farmers Market nudged me to develop affordable art as well as gave people a chance to see my work. 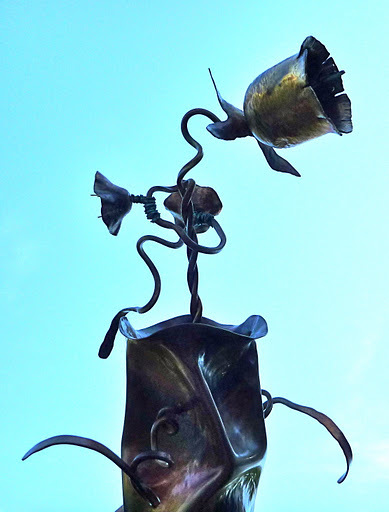 Larry received jewellery commissions and is showing sculptural pieces at Art and Jules Gallery in Halifax. “Growth Spurt” hammered copper vessel by Larry Knox, 2010. 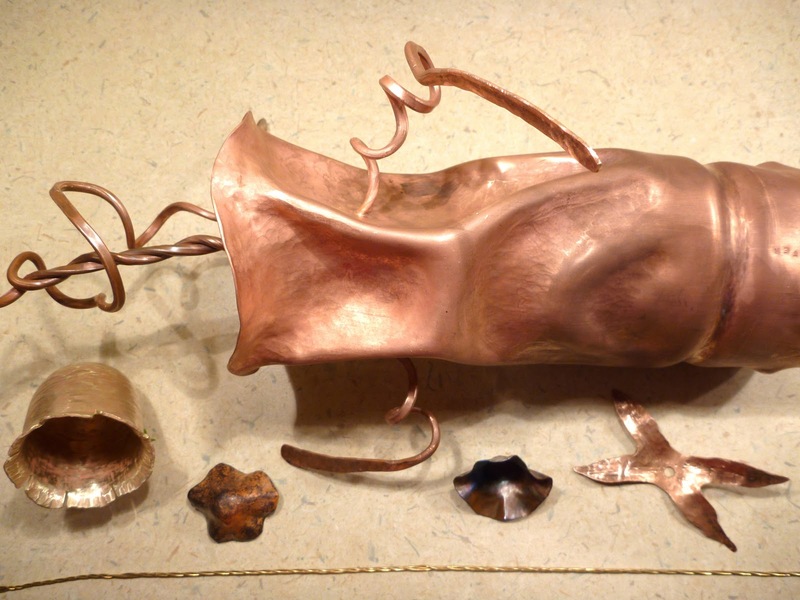 Now 2011 lies before us like a blank canvas or like a shiny sheet of copper waiting to be formed. The possibilities are infinite; the ideas are many and there are decisions to be made about content, about intention, about the best way to express one’s creativity. Blooming summer flowers were a constant inspiration. I will spend more time posting to this blog and sharing step-by-step, the creative discoveries and techniques that I am using in my work and that Larry is using in his work. Up until now my blogging focus has been on our day to day lives in our adopted village of Bear River. After three years there are over 100,000 hits on that Blog and it has even brought visitors to Bear River. It’s time for me to shift some of the energy spent in promoting Bear River into sharing our artistic life and promoting our work to the world! 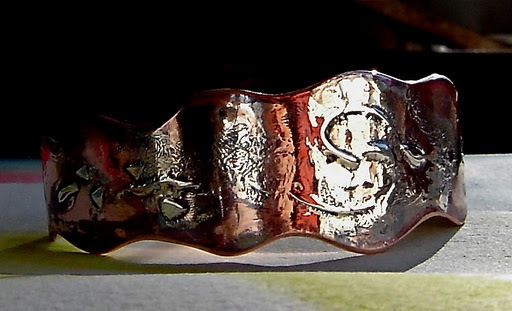 Commissioned copper and silver bracelet by Larry Knox. Larry and I are excited about these developments and we look forward to sharing our creative journey with you in this coming year. Thanks for your virtual visit! Happy New Year and may you experience many creative moments in 2011 and may some of them be inspired by our creative journey. 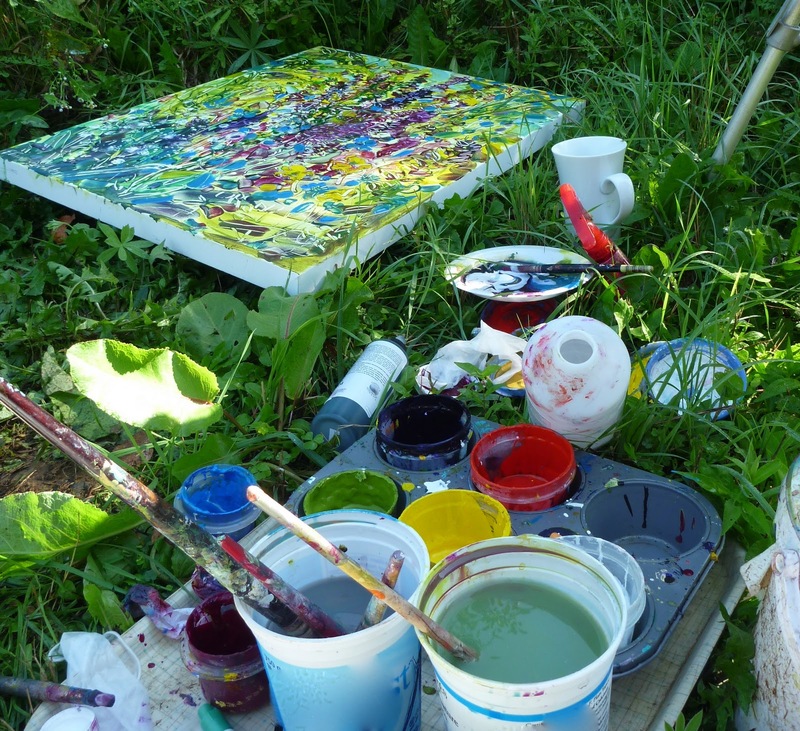 Painting outside in the summer. While my main form of artistic expression is painting, working with textiles has a big appeal for me too. Playing with fabric and fibres in the studio. At different times in my life I have woven, screen printed on fabric and sewed with appliqué. My approach to textile work is very similar to painting. In both cases I use strong colour; I enjoy lots of texture and I use the interplay of light and dark and complementary colors. Fabric painted with acrylic, printed with bubble wrap. Many, many well-known painters have worked in this medium. Last spring in Los Angeles I saw some beautiful paper appliqués by Matisse in the museum there that inspired me to sew this little bag. Cotton, arctic fleece, netting and ribbon. My daughter Emily is an animator and I am inspired by how she integrates her animation sensibilities into her sewing. Emily designs, sews and paints dolls and creatures. Another source of inspiration for me is artist’s blogs and sites on the Internet. 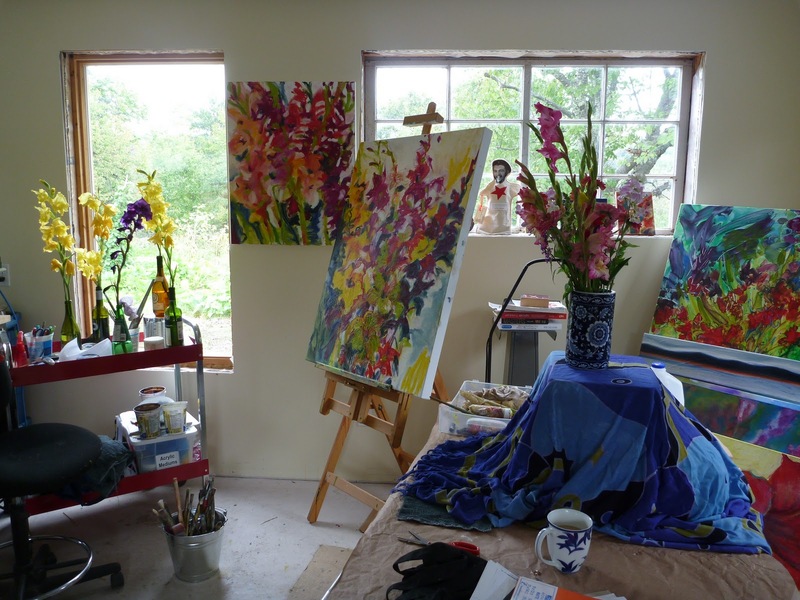 I check the daily blog of my friend and fellow painter Barbara Muir. I love her use of colour and we had many shows together in Toronto. Her persistence at writing a daily blog about painting inspires me to create and make better use of all the precious time I have. Barbara drew me while we talked on Skype! 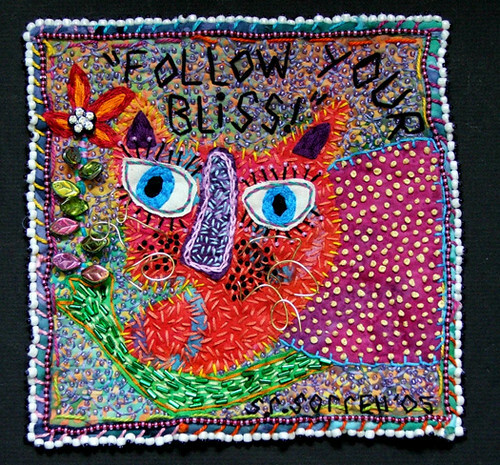 Recently I came across the site of Susan Sorrell, a fiber artist. 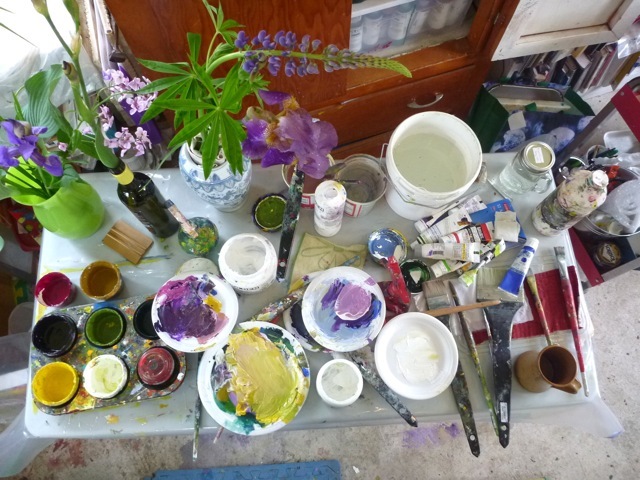 Her work excites me because of her bold use of color and texture. I signed up for an online class with her called Personal Symbols — who could resist signing up for a course with the name like that! Susan has been teaching for a number of years and the course comes with PDF handouts with lots of photographs. She has a forum on the Internet for the class where participants can show and tell their progress. I haven’t used the exact materials on her list. I’m adapting what I already have. Susan suggests painting fabric dye on interfacing fiber, but I’m using canvas and watered-down acrylics. 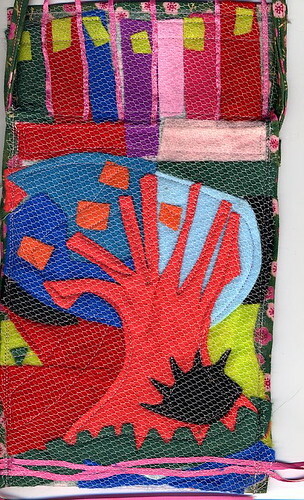 The assignments use a combination of drawing, painting and sewing which is quite exciting for me to combine. There are at least three assignments connected to each of the six lessos. 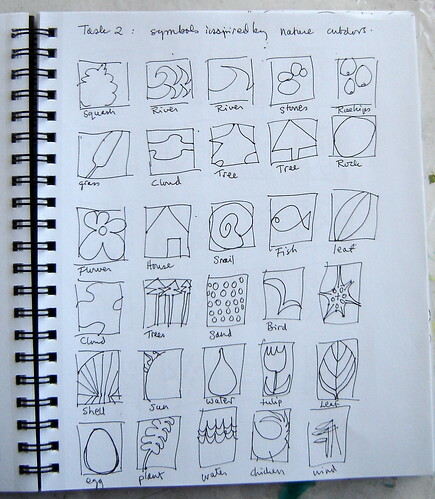 Ingeniously she had each of us draw and make up some of our own symbols. In the following image I have cut out and combined some of my symbols. The fabric is cotton and I ironed a stitch witchery product to the back of the cloth before I cut the pieces out. In this way the pieces stuck down when ironed. Then I embellished it with buttons and beads. I would like to try some of these techniques in acrylic on a large canvas. 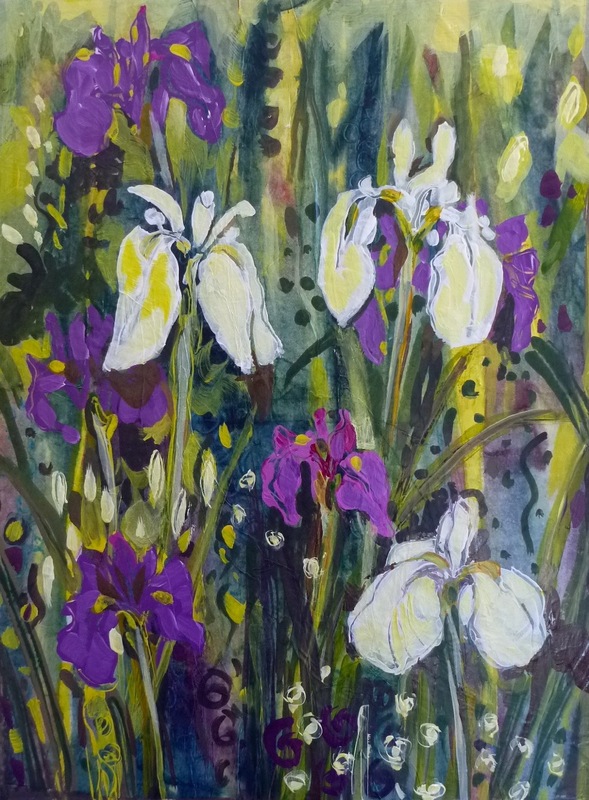 It’s nice to know that it’s possible to take a course online and to feel so inspired by it and by the links to images and blogs and websites of other participants. Susan Sorrell offers quite a few different online courses. Her enthusiasm comes across loud and clear and I would recommend any of her courses. She also hosts a monthly chat with people in the creative arts and that is quite inspiring too. The course is opening a new world for me…a truly virtual community of people combining paint and fabric and a passion for creativity.